If you are creating a Word document, a template or an add-in that is going to be used on PCs with different language versions of Microsoft Word installed, you need to pay attention to the fact that the names of the built-in styles are language-specific. This article discusses some of the problems that may occur. In addition, you can download a Word document that lets you create a list of the local built-in style names with the click of a button. 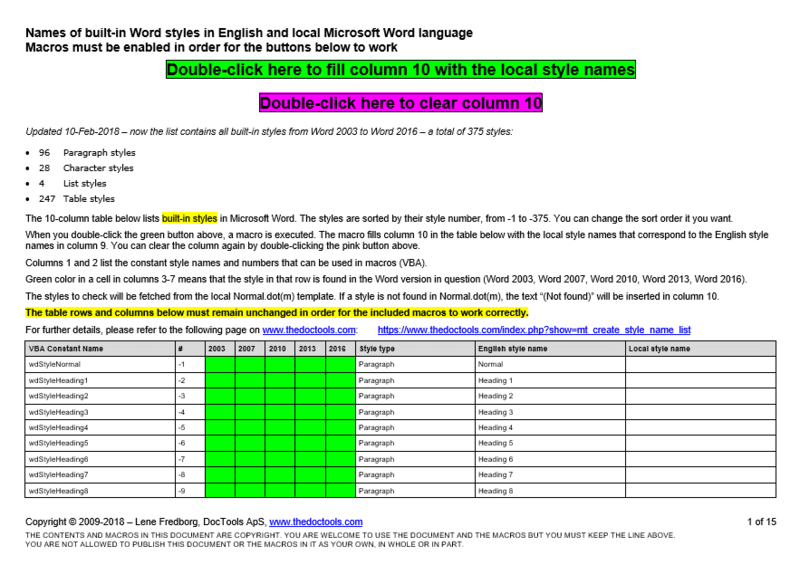 Updated 10-Feb-2018: The document you can download via this article now includes all built-in styles found in Word 2003, Word 2007, Word 2010, Word 2013, and Word 2016 - a total of 375 styles. In addition, I have added information about the different types of styles supported by Word. What are the differences between wdStyleTypeParagraph, wdStyleTypeParagraphOnly and wdStyleTypeLinked? What does style inspection > Reveal Formatting show? See the article STYLEREF Fields and Language-specific Style Names for information about the problems that can occur in relation to STYLEREF fields when different language versions of Word are involved and for tips on how you can overcome the problems. Note that the article linked above explains how you can use alias style names in STYLEREF fields. You can also use alias style names in macros. The document contains a couple of macros that can be executed via buttons in the document. Click one button and all local styles names will automatically be filled in. Another button lets you clear the local style names. You will find more details about the different style types below. 104 new styles were added in Word 2013 - they were all table styles! In Word 2016, 4 new paragraph styles have been added. The total amount of built-in table styles is huge compared to other types of styles, especially when taking into consideration that only a small part of Word users care about Table styles. Follow the instructions in the document. Please note that you need to enable macros when you open the document in order to be able to use the functionality in the document. The previous version of the document was in .doc format. The updated version is in .docm format which means it cannot be used in Word 20013. The macros have been tested in Word 2007 and later versions, including Word 2016. If you do not have access to the language version of Word for which you want to retrieve the styles names, you may send a copy of the document to somebody who has that version installed and ask him/her to run the macro, save the document and return it to you. Alternative, you may download and install the desired language pack (previously, you would have to pay for extra language packs but they are free for Word 2016). The document you can download via the link above includes information about the style type for each built-in style. When you create a new style via the user interface in Word, you can select from the style types listed in the leftmost column below. In column 2, the VBA constant for that type of style is shown (WdStyleType Enumeration). Column 3 shows the value corresponding to the constant. As for the style names, your code will be easier to read and understand if you use the constants instead of the values. The user interface of Word does not include a style type option corresponding to wdStyleTypeParagraphOnly. There appears to be no difference between the styles created as wdStyleTypeParagraph and wdStyleTypeLinked. They both appear with the symbol consisting of a Pilcrow and an a: ¶a. The style of the type wdStyleTypeParagraph appears with the Pilcrow symbol only, ¶. Styles that have the combined ¶a symbol can be applied to either entire paragraphs or be used as character styles, i.e. applied to part of a paragraph only. However, it is only possible to use such style as a character style if the option Disable Linked Styles at the bottom of the Styles Task Pane is unchecked. I recommend checking that option in general to prevent paragraph styles from being used as character styles. The makes it easier to keep a clean and consistent formatting. If checking the three styles via Styles Task Pane > Inspection > Reveal Formatting, all three styles appear as Paragraph styles. you will see a large number, e.g. 372 in case of Word 2016. This means that the document contains all those styles but they don't appear in e.g. the Organizer list unless they have been in use. You can apparently delete built-in styles, e.g. via the Organizer dialog box. But note that the styles are not deleted - it just looks as if they have been deleted. If you check the count of styles again, you will see the same number as before. Also, if you try to apply a built-in style you just deleted, e.g. via VBA or by typing its name in the Apply Styles dialog box and clicking Apply, you will see that the style is applied. It has not been deleted! Word Style Names in English, Danish, German, French. See also the article STYLEREF Fields and Language-specific Style Names.